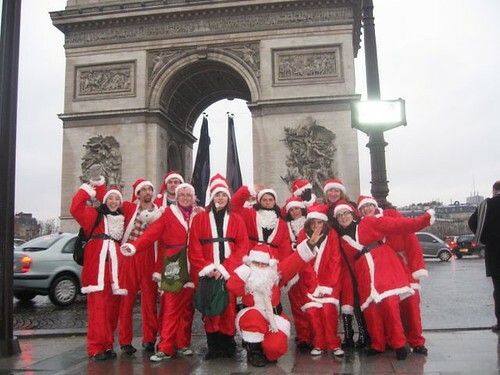 Welcome to Santacon Paris ! Here’s Santa, the man in red with the basket fuuuuull of gifts for all the girls and boys of the world ! Do you like surprises ? do you like Joy ? Would you like more spices while all people burn their credit card in made-in-china goods big shops ? Having Fun in a civic and alternative way ? Here’s Santacon, join the Santa Party ! Hé Hé !! Le gros bonhomme et sa hotte reviennent dans la Ville des Lumières ! Il était bien là l’année dernière en plein soleil sur les marches.. Et il revient pour mettre plus de magie dans votre Décembre 2008 !